Gurgaon being the hub of party areas, has plenty of venues to select from, choosing a suitable one for your event will likely be one of the most difficult decisions of your entire planning process. 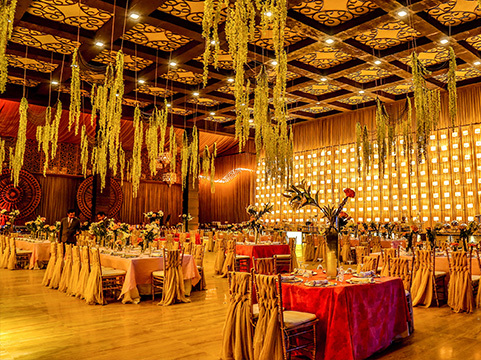 The venues by FNP Gardens offer two lavish banquet halls in Gurgaon that are known to serve your requirements in the best way. 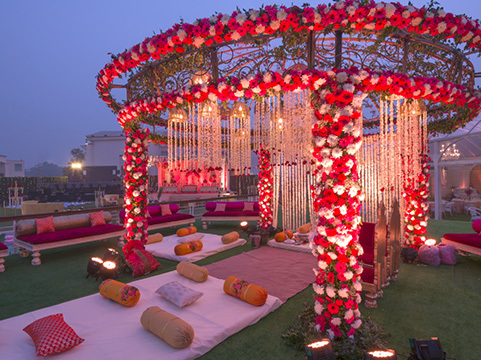 The Ritz and The Riviera by Ferns N Petals are noted amongst the most popular luxury wedding venues in Gurgaon. Both the venues offer spaces to capacitate more than 1500 people that make them counted as mega venues in the area. 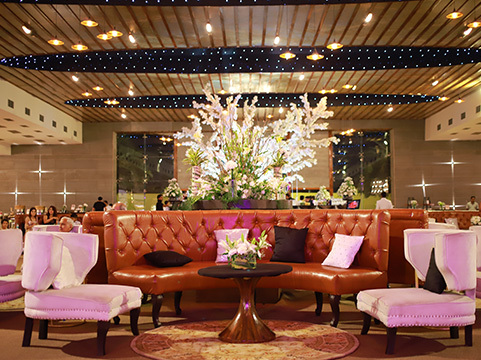 Not only larger spaces, these venues exude luxury through their breathtaking décor, designed by experts. 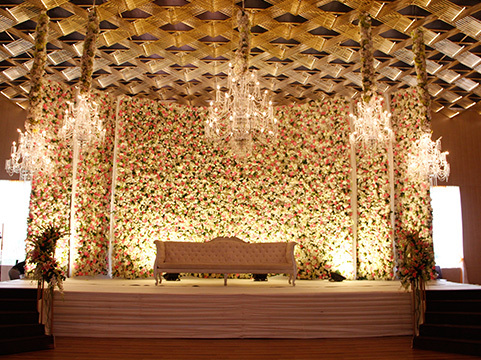 The Ritz is one of the premium Gurgaon wedding venues, which is designed on the lines of French Renaissance. 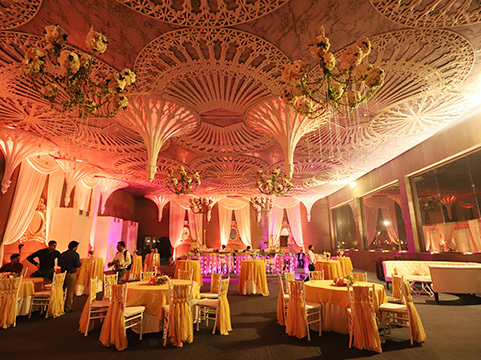 This opulent venue is located at The Ambience Island, Gurugram and it exudes luxury through all its elements. Has a capacity of accommodating up to 600-1500 guests. The Riviera is one of our most luxurious wedding venues in Gurgaon, and also one of the most sought after property for grand weddings. It is located at The Ambience Island, Gurugram and it offers a wide array of facilities to craft a personalized wedding. Spread across the area of 65,000 sq. ft.
Has a capacity of accommodating up to 1000-2000 guests. The Ritz is basically designed on the lines of a French Chateau with all white décor. The Riviera has more of golden, larger than life elements that add oomph to its décor. The Ritz has an area of 50,000 Sq. ft., of fixed banquet setting that can accommodate Venues by FNP Gardens are amongst the most lavish banquet halls in Gurgaon. The Ritz and The Riviera are all about opulence and their luxurious décor makes them 1500 to 2000 guests. The Riviera is spread across the area 60,000 sq. ft. that can capacitate more than 2000 guests. 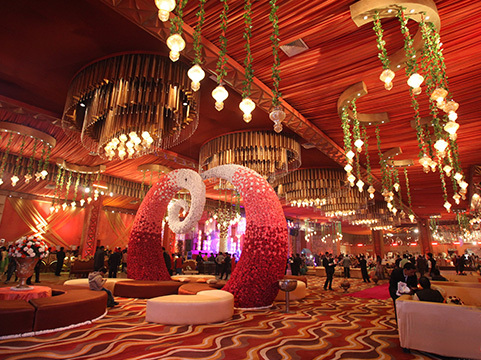 Both the venues are famous as mega wedding venues in Gurgaon because of their wide spread of area. The Ritz has also been awarded as one of the best luxury wedding venues in Gurgaon by EEMA. Not only wedding events, The Ritz and The Riviera can also serve as corporate events like conferences, corporate shows and Award Ceremonies. The Ritz as well as The Riviera both have a parking area for more than 2000 cars Both the venues offer a Magical Ambience Designed by Experts. They provide fully Automated Technical Support. 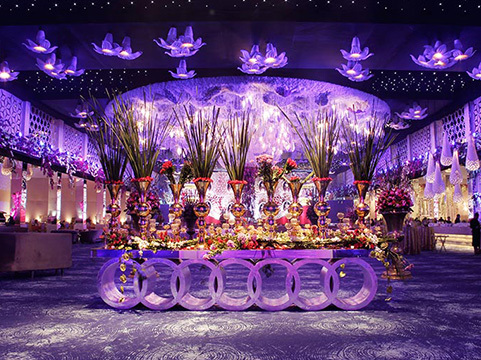 Noted as the top luxury wedding venues in Gurgaon.